Becky really was THAT TINY. This is what gets me everytime, Becky’s NICU hats. The super teeny tiny preemie hat that could not fit on a baby doll but fit on my daughter. And then when she grew into the next size up, that one could fit some dolls but not others. It was at these points that Becky was wearing her first outfits and they were preemie-sized. She literally swam in them. 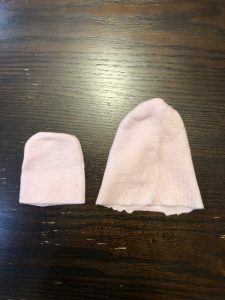 See the pic below comparing Becky’s preemie hat sizes. As a NICU graduate it took a while (months) for her to fully grow into the preemie clothes and she spent a long time (many, many more months) in newborn clothing. How did your preemie do with hats, with clothing? 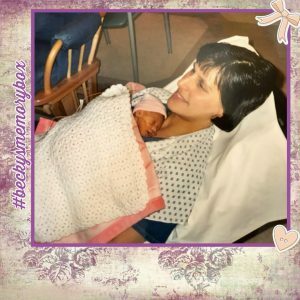 How long did it take for your preemie to fill into the preemie hats, the preemie clothing? Tell us!